When I mentioned to a friend of mine that I was writing about a new place called Blades, she quickly exclaimed, "THE Blades?!" For those that frequented the nightclub scene in the 1980s, Blades was apparently the place to be. Owner Sami Mina (of Aladdin's, Pomodoro, and Saha Med Grill) opened Blades in 1983, and has decided to resurrect the name for his new venture that serves breakfast, brunch, and lunch in the space next to Pomodoro Grill & Wine Bar. Blades Diner (1290 University Avenue), occupies the former space of Saha Med Grill, and has even kept a few of the dishes from Saha on the new menu. The diner's breakfast and brunch menu includes standards like eggs and toast, but nods to the more health-conscious with the Acai Bowl ($9.50), a combination of Acai berry pulp, shaved coconut, berries, bananas, strawberries, granola, and honey. 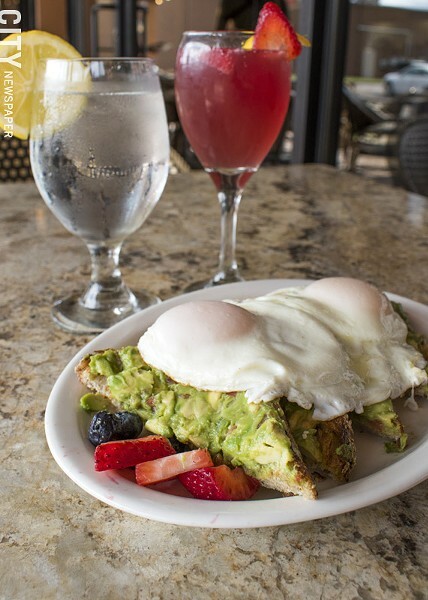 The avocado toast craze has not appeared to lose any momentum, and Blades' version ($8) is served on thick-cut whole grain artisan toast with lemon extra virgin olive oil, and topped with two basted eggs. Mina's enthusiasm for this new venture extends to his staff, who are excited to share the new dishes with customers and to try all the dishes themselves. When creating the menu, Mina was sensitive to those with food allergies, therefore many of the dishes can be made gluten-free. Blades uses no peanut products; almond butter is substituted for peanut butter. 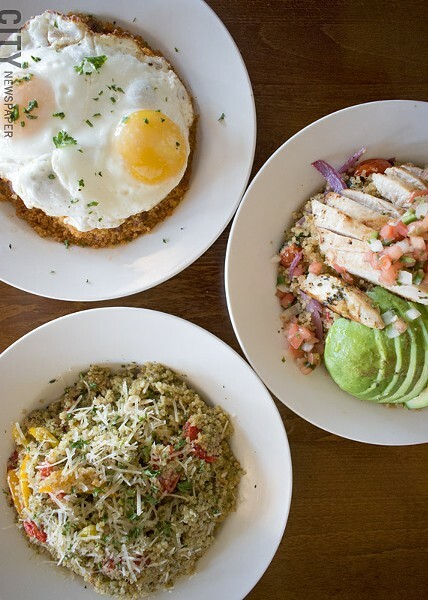 Vegetarians will find plenty of options on the menu, as well. The Quinoa Bowl ($12) piles roasted vegetables, avocado, and Pico de Gallo on top of quinoa. The Pomodoro Quinoa ($12) combines Italian sausage, spinach, tomato, basil pesto, parmesan and quinoa. Beer and wine is served at Blades, with a variety of mimosas available for $7, and a Sake Bloody Mary ($6). Mina will soon start roasting his own coffee in house as well. Outdoor seating is available (weather permitting), and there is plenty of parking both in front and on the side of the building. Blades does not take reservations. Blades Diner (1290 University Avenue) is open Monday through Sunday from 7 a.m. to 3 p.m. 266-5000. bladesbbl.com. Fall peeked her head through the door, but decided she is not ready to make her grand entrance yet. That doesn't mean the influx of fall festivals is going to hold off any longer. The Honeycrisp Apple Festival & The Great Candy Drop will take place Saturdays and Sundays, September 15, 16, 22, and 23, at Wickham Farms (1303 Sweets Corners Road, Penfield). Festivities start at 10 a.m. and end at 4:30 p.m. The Candy Drop (candy is literally dropped from the sky -- dreams do come true) will take place at 2 p.m. each day and an apple peck purchase is required to participate. wickhamfarms.com/honeycrisp-the-great-candy-drop. Also happening at the end of September, the Naples Grape Festival (137 North Main Street, Naples) on Saturday and Sunday, September 29 and 30, 10 a.m. to 5 p.m. each day. naplesgrapefest.org. And the Hilton Apple Fest (West Avenue between Heinz and Henry Streets, Hilton) takes place on the same dates. Lovin' Cup (300 Park Point Drive) will be celebrating its 10-year anniversary on Saturday, September 29, from 5 p.m. to 1 a.m. The festivities are free to the public and will feature live music by The Niche, Pia Mater, Sounds like Sunday, and Lovin' Cup's own family band, Old School, featuring the Lovin' Cup co-owners. A special beer collaboration between Three Heads and Lovin' Cup will be released as well. More information at lovincup.com. As if I have not given you enough options for the weekend of September 29 and 30, here is another one: Parktoberfest will take place on Saturday, September 29, from 12:30 p.m. to 2 a.m. at Dragonfly Tavern (725 Park Avenue). German food and cold beer will be served all day. More information on Facebook (search Parktoberfest). CoreLife Eatery has opened another location in Brighton at 2600 Elmwood Avenue.